Summertime … and the grilling is easy. Cheese is melting, and the pizza is fine. Okay, I’m no George Gershwin, but what I’m trying to say is this: Pizza on the grill is not only easy, it’s one of the quickest summertime grilled meals possible. What do I like about it most? The fact that I don’t have to deal with my smoke alarms going off. Yeah, that happens whenever we cook pizza inside. The super-heated oven ends up burning the corn meal that remains on our pizza stone. Pizza in January usually means both our front and back doors are open to prevent smoke buildup. No. Kidding. 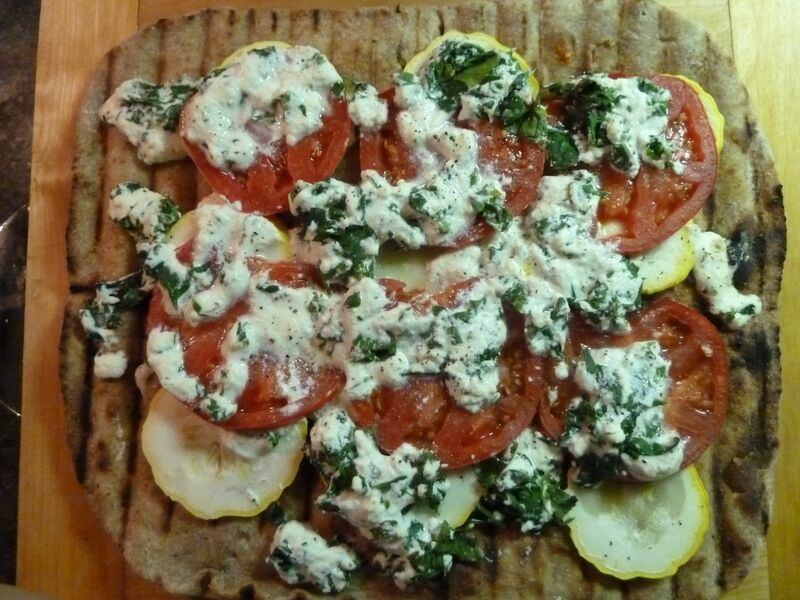 So, when we can slap that pizza dough on a hot grill, we go there. And you can go there, too. I’m not going to tell you what kind of pizza to make. Your toppings are your toppings. You want pepperoni? Have pepperoni. You want smoked salmon? Go for it. Sauce? Yes, please—but don’t go overboard. A little dab will do ya (I’m showing my age with that quote). 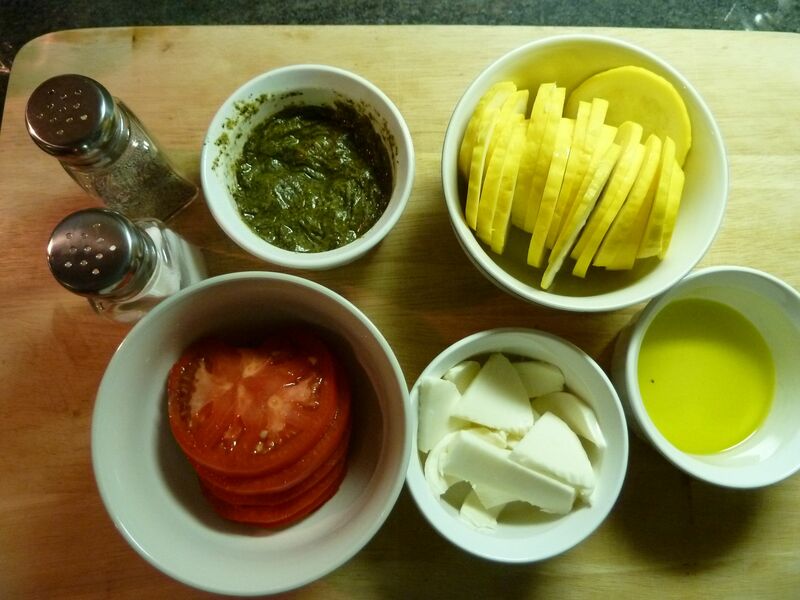 My assorted pizza toppings, minus a bowl full of kale-ricotta mixture. Plus, I’m not the pizza maker. Jennifer is the star when it comes to assemblage. I make the dough, I’ll make sauce. I’ll sous, but she chefs when it comes to pizza time. We’re practiced at this, but the following are our tips, not our must dos. Also, p.s., our grilling is done on a gas grill. Charcoal? A slightly different animal, so adjust as you see fit. A hot hot grill is good. 500F is good. Clean it really well, not leftover burnt chicken skin, please. Prep your toppings. I can’t emphasize that enough. Slice, dice, chop, stir. Get ’em ready. AND, pour a small bowl – maybe 1/3 to a 1/2 cup? – of olive oil to have on hand. Put ’em all on a big cutting board or tray to carry out to the grill. Roll out a nice flat but not too thin dough. Round, square, oblong, whatever. Here’s a great trick: Lightly oil a section of aluminum foil. Take that dough you just rolled out and put it down on the foil. Now, lightly swab the top of the dough with oil. Okay, maybe I over-oiled this one. Swab off any extra oil! Grill’s good and hot. Your toppings are ready to go. Your dough is ready to go. So, go out to the grill and … Quickly flip that dough, oiled top side down, on top searing-hot grill, and peel back the foil. There’ll be some “yikes!” and “oh, sh*t” moments, I’m not gonna lie to you. Pull the dough one way or the other, make your tweaks QUICKLY, and then close that grill cover. And fast. 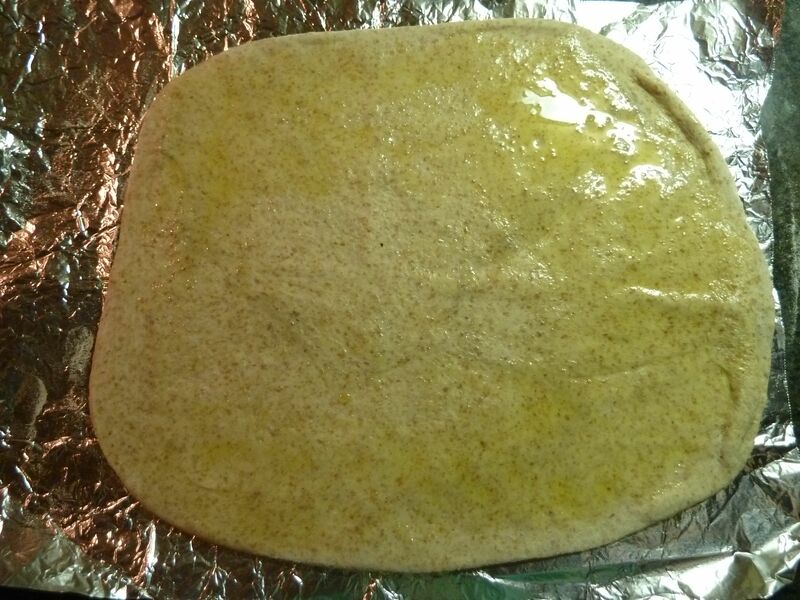 The sooner heat completely surrounds the dough, the quicker that dough is going to turn into a pizza crust. Right? Right. Two-three minutes. Peek once or twice to make sure the underside is not burning. Oh, it’ll burn. Believe you me. Oh damn, I burned the first one. These things happen. NOTE: The first dough got kinda … well … crispy. I started another. Much, much better. Get your mise en place in place, ready to go. 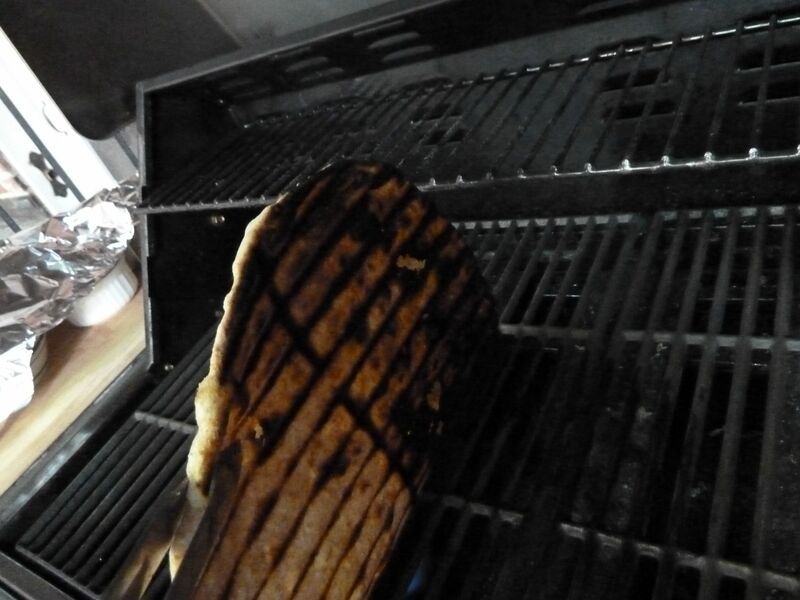 Open the grill, flip that crust over. Not using a sauce? Then give a quick brush all over the top with evoo. Using a sauce? Spread it thinly and quickly. Layer everything else on as you see fit. And be quick about it! Close the lid for another couple of minutes. Keep an eye on the bottom, making sure it’s not burning. When the cheese (if you’re using) and the sauce look melty and hot, it’s time to take it off the heat. Let sit for three minutes to let the sauce and toppings set. And then cut yourself a slice. You are currently reading Grilled Pizza at The Dainty Dot.